Kim Halsey is not the common divorcee. A serial monogamist as she calls herself, "she collected 2 husbands and 3 children in her twenties, and then, 2 husbands and blended families in her forties." All this collecting, yet at the end, Kim walked away empty-handed, without the love she needed and wanted. By her own confession, she fell in love hard each time, too soon and left each time, too late. Kim confesses that she's not alone in the struggle of paying attention to those nagging red flags. As she writes on her blog, from all the women she has worked with and coached, along with herself, she has learned that "we know in our deepest soul when it is time to let go. The problem is, we rarely follow our heart the first time we know for sure this isn't working." Once she decided to follow her heart and get off this rollercoaster of love gone wrong, she set out to reclaim her life and self-identity back in a huge way. She got rid of every single piece of jewelry she ever received from the former loves of her lives, including her wedding ring, either by selling them on our platform or repurposing some of the diamonds as gifts for loved ones. "I really did not want any of the past diamonds around. Bad juju", she says. She felt holding onto these marital "gifts," were attacking her energy and bringing her down, so she cut the jeweled ties of the past. She got out with the old, and in with the new Kim. It didn't happen overnight though. So, if you've been struggling to part with your wedding rings and jewelry, don't feel alone. Kim shares that she "had been holding onto the big ring (over 1 carat) for about a year as the divorce was in process." A whole year went by before she could part ways and sell her ring on our platform. Instead of chasing after another long-term love, she used the money to marry herself. To court, woo and vow that she would give herself every single drop of attention and love that she had once given her former partners. To realize that all this time, it was her that needed to love and invest in herself—not another person. To celebrate her "marriage to Kim," she bought herself a beautiful ring, and then took the money to fund her own honeymoon, traveling to her heart's content for a year. This insightful woman gives back by career-coaching newly singled women, whether from death or divorce, helping them to reclaim themselves like she did. Making her life's journey truly purposeful and "worthy" by helping others find their life paths as well. With each one of her clients, Kim's goal is to help them create a life they love that truly shows off their own internal pride and caters to their individual wants and needs. Q: How long have you been holding onto the ring? A: I had been holding onto the big ring (over 1 carat) that Worthy sold for about a year as the divorce was in process. Q: Why did you decide to sell now? A: It was painful to remove and even more painful to look at in my jewelry box every day. Once I knew reconciliation was not possible, it had to go. A: I found Worthy online probably through pop-up ads after I had been searching for a solution. I read all the testimonials I could find. It sounded too good to be true! A: I had sold rings from my last marriage at a pawn shop. It felt humiliating and degrading to be there. And, I got only a fraction of what the set was worth. 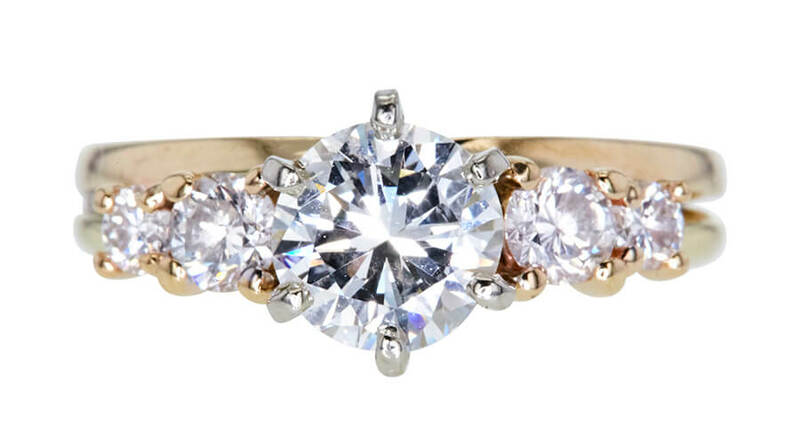 Kim's GIA 1.13 CT round cut bridal set ring, sold at auction on Worthy. Q: Did you have any hesitations before selling the ring? A: I had serious hesitations about sending diamonds through the mail to a company I had never heard of before. Q: How would you describe the process? A: The telephone communication was reassuring. Your process of sending a pre-insured box overnight for the agreed upon sale value of the ring put my mind at ease. Also, the fact that I didn't have to accept any offer less than what my asking price was gave me some sense of control in the process. It was a short auction and within 10 days, the money was deposited to my bank. Q: In your article, you mention that you got rid of every gift of jewelry from every previous marriage. Can you tell us a little more about that? A: I had several smaller pieces of jewelry with multiple diamonds that did not meet the 1 carat requirement. Worthy appraised, suggested a sale price, and sent the same pre-insured overnight box for the pieces I chose to sell. There were a couple that wouldn't garner what I was willing to part with them for, so I took those diamonds to a local jeweler and had them reset into a ring for a relative. I really did not want any of the past diamonds around. Bad juju. A: I was extremely satisfied with the fair appraisal and the actual sale price I got for the ring. A: That money funded my travel to Hawaii, Las Vegas, and East Coast that year. Reminds me of the song "She let herself go". It was a great way to reclaim my re-singled life!